If you normally attend sanctuary services, you’ve probably heard the Chancel Choir share music during worship. We sing on the first Sunday of the month at 8 a.m. worship and on the second, third and fifth Sundays at 10:30 a.m. worship. Depending on the season, you may also hear us sing on the fourth Sunday of the Monday at 10:30 a.m. worship. But we don’t limit our singing to worship services here at St. John’s. For the past two years, we have shared the Christmas cantata with patients at St. John’s Hospital when we sang in their chapel. Our cantata was broadcast via closed-circuit tv to patient rooms. Once a month, a group of us travel to Concordia Lutheran Village to sing during worship led by one of our pastors. It is a wonderful opportunity for outreach! This past December, we presented our Christmas cantata to an appreciative group of residents and guests. On April 16 we will be sharing this year’s Good Friday cantata at Concordia. We are grateful to Rosemary Carlson for her enthusiasm in promoting the Chancel Choir at Concordia. Our Good Friday Cantata is entitled Who is Jesus? You will notice that the title is not Who was Jesus? The present tense is used because the cantata is focused on Christ’s interactions with our lives today. Accompanied by a small chamber orchestra, piano and organ, along with two narrators, this composition uses some well-known hymns and spirituals, including I Want Jesus to Walk with Me; Lord, I Want to Be a Christian; and I Have Decided to Follow Jesus, to name just a few. The cantata will be presented on Friday evening, April 19 at 7 p.m. in the sanctuary. 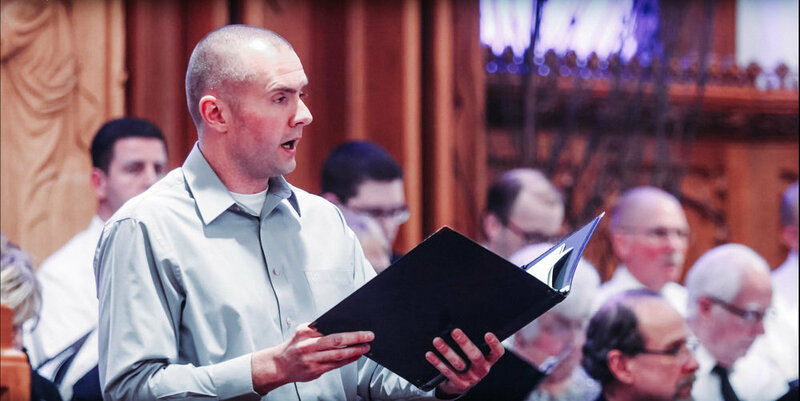 On Monday, March 18 at 7:30 p.m. the Bradley University Chorale will present a concert in the sanctuary here at St. John’s. This is part of their Spring Tour through Illinois, Missouri and Kansas. Thdey sing under the direction of Dr. Cory Ganschow, a college classmate of Christie Lazarides-Purdy. Dr. Ganschow earned a Ph.D. in Choral Music Education from the University of Missouri-Kansas City Conservatory of Music and Dance, an MME from Illinois State University and a BME from Millikin University where she studied conducting with Dr. Brad Holmes, known to St. John’s disciples for his outstanding Christmas Vespers. Don’t miss this incredible group of young singers! Invite your friends and neighbors to this concert which is free and open to the public. A goodwill offering will be taken. And mark your calendars for Thursday, December 5 at 7 p.m. when we welcome The King’s Brass on their 2019 Christmas Tour! We have a new choir here at St. John’s! The Joyful Noise Children’s Choir began rehearsals in January and have been preparing music to share during worship in both the sanctuary and PLC services. Each Wednesday evening, sixteen young singers meet in the Music Room from 6:30 to 9 p.m., following the Wednesday night meal, to learn songs and to study music. In addition to learning the tunes and words of the songs, they’re learning music terminology and other elements of music theory. While many children’s choirs focus only on unison singing, we are working on two-part songs so that we can improve our musicianship. We pack a lot of work into 30 minutes of rehearsal. Joyful Noise will sing in the sanctuary on March 3 and May 5 at 10:30 a.m. worship and on April 7 at the PLC worship service. Get ready to hear an enthusiastic young group of singers share their music! If you have a young singer who would like to join us, please contact Sue Hamilton.